January 13, 2011 - In its continuing investigation of the runway overrun of a jetliner in Jackson Hole, Wyoming, the National Transportation Safety Board has developed the following factual information. 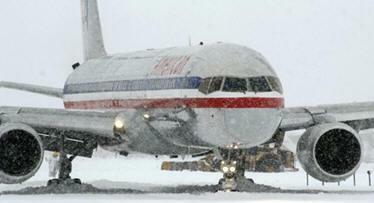 At about 11:38 am MT on Wednesday, December 29, American Airlines flight 2253, a B-757-200 (N668AA) inbound from Chicago O'Hare International Airport, ran off the end of runway 19 in snowy conditions while landing at Jackson Hole Airport. No injuries were reported among the 181 passengers and crew on board. Instrument Flight Rules (IFR) weather conditions prevailed around the time of the incident with a ceiling of 400 feet, light snow and visibility of 1 mile. Winds were 10 knots from 240 degrees. Runway friction measurement data obtained before and after the event have been provided by the Jackson Hole Airport Authority for further evaluation by the NTSB. In the continuing investigation, work groups have been formed to examine the subject areas of air traffic control, airports, meteorology, flight crew operations, airworthiness, maintenance records, cockpit voice recorder (CVR), flight data recorder (FDR), and airplane performance. The NTSB systems investigator conducted testing on the incident airplane from December 31, 2010, through January 6, 2011. Operational testing and examination was accomplished on the spoiler/auto speed brake, air/ground, autobrake, and thrust reverser systems. No discrepancies were found in the air/ground, autobrake, and thrust reverser systems. Examination of the auto speed brake mechanism in the cockpit pedestal found that the linear actuator aft attachment was improperly installed and was missing a bushing. This loose connection allowed the cam to be rotated slightly relative to the switch, which could cause the switch roller and the notch in the cam to not always align. System operation with this condition present is being investigated. The maintenance group convened at the American Airlines facility in Tulsa, Oklahoma, to review airplane logbooks. The group focused primarily on the spoiler/speed brake, air/ground, and thrust reverser systems. No significant issues with any of these systems were recorded prior to the incident, and there were no open minimum equipment list (MEL) items at the time of the incident. The airplane was manufactured in June 1992 and, at the time of the incident, had accumulated 58,879 hours and 20,518 cycles. No discrepancies were noted during the last periodic service maintenance check conducted on December 26, 2010. The last heavy maintenance was accomplished in October 2005. The auto speed brake actuator was replaced in January 2008. The CVR group convened on January 4, 2011, at the NTSB recorder laboratory. The group completed a transcript of the last 30 minutes of the recording and a summary of the previous 90 minutes. The transcript will be released when the public docket is opened. The FDR group has begun the process of determining which of the documented parameters are installed and should be functional, and is checking the recorded data for validity. The group has verified the following factual information. The FDR download contains the last 43.9 hours of data, more than the required 25 hours, and includes all of the incident flight. The recorded speed brake handle position indicates that the speed brakes were manually extended by the flight crew during the approach after which the handle was left in the armed position until landing. The FDR records only the speed brake handle position and not the individual speed brake (spoiler) panel positions. The FDR data indicate that the aircraft touched down at approximately 132 knots. At touchdown, the air/ground parameter changes to "ground" for approximately one second and then switches to "air" for approximately ? second before changing back to "ground" for the remainder of the recording. During the time period when the air/ground parameter switched back to "air," the speed brake handle position momentarily moved toward the down position and then returned to the armed position where it stayed for the remainder of the recording. Thrust Reverser (T/R) discrete parameters indicate that the T/Rs moved into the in-transit position during the ? second that the air/ground logic parameter indicated "air." The T/Rs remained in the in-transit position for approximately 10 seconds before transitioning to the stowed position for one second. The T/Rs then moved back to the in-transit position for an additional 6 seconds before becoming deployed.